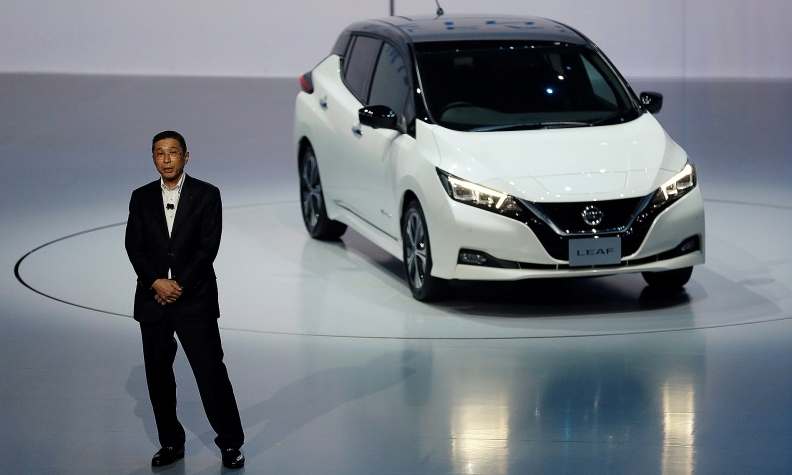 Nissan CEO Hiroto Saikawa, with the redesigned Leaf last month, called the company's latest recall a "shocking" lapse after Japanese regulators discovered unauthorized inspectors had approved vehicle quality. Carlos Ghosn, one of the auto industry's most celebrated turnaround artists, saved Nissan Motor by managing himself out of numerous tight spots. Now his hand-picked successor faces a big test of his own, just six months into his tenure as Nissan's CEO. In what Nissan CEO Hiroto Saikawa has called a "shocking" lapse, the automaker announced on Monday that it's recalling 1.2 million vehicles in Japan after regulators discovered unauthorized inspectors approved vehicle quality. The recall covers all models produced in Nissan factories in Japan and will cost the company 25 billion yen ($222 million). Less than 48 hours later, Nissan's stock took a hit after the Kyodo news agency reported that the company allegedly falsified inspection documents to make it seem as if authorized inspectors had checked the new vehicles. The shares dropped. A Nissan spokesman declined to comment on the report. "It sounds like CEO Saikawa wasn't aware of the problem, and if it was just a mistreatment, that's neglecting their duties, and that sure is a problem," said Koji Endo, an auto analyst at SBI Securities in Tokyo. "What's worse, and becomes a bigger issue, is that if the people at the factories were all aware and had practiced falsifying documents, regardless of whether the top management was aware." The Japanese auto industry has been reeling from multiple scandals involving product quality and falsification of records. In June, airbag maker Takata Corp. filed for bankruptcy after one of the world's most famous recall crises. Last year, Suzuki Motor Corp. admitted to using unapproved fuel-economy testing methods in Japan, following similar disclosures by Mitsubishi Motors Corp. prompted greater scrutiny by the nation's transport ministry. There's no evidence so far that Nissan intentionally misled regulators. However, on Tuesday, Japan's transport ministry conducted on-site inspections of Nissan facilities in Tochigi and Kyoto, ministry spokesman Masao Notsu said. If the media report is true, the company may have acted improperly, said Naoki Fujiwara, chief fund manager at Shinkin Asset Management in Tokyo. The decline in Nissan's stock "is seen as a speculative move reacting to the bad news," he said. Nissan shares slumped as much as 5.4 percent Monday after the automaker said late Sept. 29 that it had temporarily halted vehicles for registrations in Japan. The stock bounced back Tuesday after analysts such as Takeyuki Atake, a credit analyst at SMBC Nikko Securities, wrote that sales won't be affected. After Wednesday's Kyodo report, the shares tumbled again, closing 1.2 percent lower. The automaker's shares have declined 7.3 percent this year, compared with a 2.2 percent drop for Toyota in the same period and a 1.3 percent loss for Honda Motor. Nissan will call back for inspection vehicles from as many as 24 models made and sold between October 2014 and September 2017. The cars have no quality issues and won't need to have any parts replaced, the company said. Nissan vehicles exported from Japan aren't involved in the recall. "Saikawa should do everything he can to uncover the whole picture and tell the truth to the public," said Ken Miyao, an analyst for auto research company Carnorama Japan. Saikawa said he will personally investigate the issue and find out the cause before deciding who should bear responsibility. There will also be an external probe, he said at the company's headquarters in Yokohama on Monday. Ghosn, a Brazilian-born French national revived Renault as executive vice president from 1996 to 1999. He then was assigned to turn around Nissan, where he reduced the Tokyo company's purchasing costs, shut five factories, eliminated 21,000 jobs and invested the savings back into 22 car and truck models in three years. "The best thing for Saikawa to do is to expedite the investigation," said Tatsuo Yoshida, an analyst at Sawakami Asset Management.